The interactive mystery-comedy is written by Billy St. John and will be directed by Kandese Green. Every production will have a different ending. 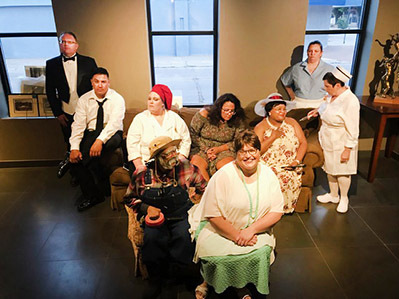 Pictured above are the cast members, from left: Lindell Smith as Bensonhurst, the butler; Isaiah Mendoza as Mike, the detective; Randi Grantham as Minerva, the cook; Maria Almanza as Rufus, the handyman; Alesa Anguiano as Fiona, the dizzy niece; Becky Terpening as Kathy, the secretary; Fertisha Hall as Paula, the Southern belle; Rebecca Griffin as Mrs. Trent, the housekeeper; and Melanie Dipple as the overworked Nurse Withers. Not pictured are Donald Dutchover as Jordan, the young nephew; Lindsay Waugh as Lois Van Zandt, esq. ; James Bennett as Simon Starkweather, the rich old man, and Simon Starkweather III, his grandson; and Kimmy Bennett as Nancy, the maid. Performances are scheduled for 7 p.m. Friday, Sept. 21, and Saturday, Sept. 22, and 2 p.m. Sunday, Sept. 23, at the Ocotillo Performing Arts Center. Admission is $15 for adults, $5 for students (through high school) and may be purchased from any cast member, at Bryan Printers or the OPAC, or at the door. Dessert is included.